Before you list your real estate for sale, consider a proven way to sell your house: expert home staging. Home staging benefits include fewer days on the market and better offers. Decide on professional home staging for a quicker home sale. Think of staging your house as creating a "style" for your home similar to what a manager would do for a notable client. Just like creating a style gives more attention to a singer, staging makes your house more attractive on the market. If your home is empty, think about renting furniture. The goal is for your house to appear ready to live in as opposed to cold and empty. Increased weeks on the market are sure indicators of homes that lacked being staged. As a real estate professional in San Diego, California, I can give you home staging tips so that your home sells fast. Staging your property for an Open House shouldn't be thought of as an annoying experience. It can turn into an eye-opening and inventive task. Together, we'll strive for a premium offer for your house. For additional information about home staging to sell your place quickly in San Diego County, contact us and we'll use our San Diego expertise for the fastest ways to sell your home. First, look at the outside of your house, also called your curb appeal. Inspect the exterior of your house from the view of a passerby. What do you notice first? What would've-been-eye-catching characteristics seem waiting to be noticed? Knowing this helps us to choose what we can do to invite buyers from the street and into your house. If your home isn't the best it can look on the outside with touched up paint and bright greenery we'll need to address those as well. Follow the Curb Appeal Checklist and add dollars to your house's final selling price. Could a buyer picture themselves hanging out in your living area, unwinding in your spa tub or getting work done in your home office? We want your home to welcome buyers and offer them a sense of comfort. 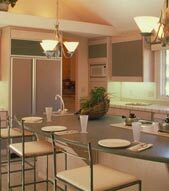 I'll help you accomplish this by suggesting small improvements that enhance your home's features. I'll help you put out of sight items that give the look of clutter. Table and counter tops should be free and clear. Brick-a-brack, souvenirs, family photos, and play time works of art should get moved out of sight. We'll de-clutter your house. Unattractive or busy areas make your home seem smaller and buyers have a harder time picturing themselves living there. Every area gets a once-over. I'll note the pieces of furniture that should be removed, rooms that need new paint, carpet needing to be changed, fixtures that need polishing, and any other improvement that can easily be made to positively impact the sale. Working together, we'll make sure your house is likable and that it's welcoming, avoiding "offensive" or "too-bright" shades on the walls and furniture. And if none of your belongings are there, you can consider borrowing furniture. You want your home to look lived in as opposed to uninhabited. At every showing, we want to capture buyers' attention. To eliminate shadows a mood changer and we'll part the curtains, and reduce shadows where needed to invite the buyer inside. We'll enhance the mood of the house with enjoyable music playing lightly and assure a pleasant aroma circulates from every room. We'll make use of cozy-looking throws, and place pillows on your couch and bedding. Buyers should feel like your current place has the potential to be.